This article explains how to generate different documents based on the response submitted. Form Publisher will send different documents based on response submitted. Please read this tutorial to learn more about this feature. If Delphine answers ‘Yes’ to join the event: She will receive the invitation card. If Delphine answers ‘No’ or ‘Maybe’ to join the event: She will receive the planning of future events. Create your Google Form with the questions you want. In our example, we selected ‘Multiple choice’. warning As the 'save' button is situated at the end, please note that if you exit before the last step of the first configuration you will have to start over again. warning The name inside your marker <<>> must match exactly the question title of your Google Form, as Form Publisher is case sensitive. info Each time you make changes, make sure to click ‘Done’ or ‘Save’. 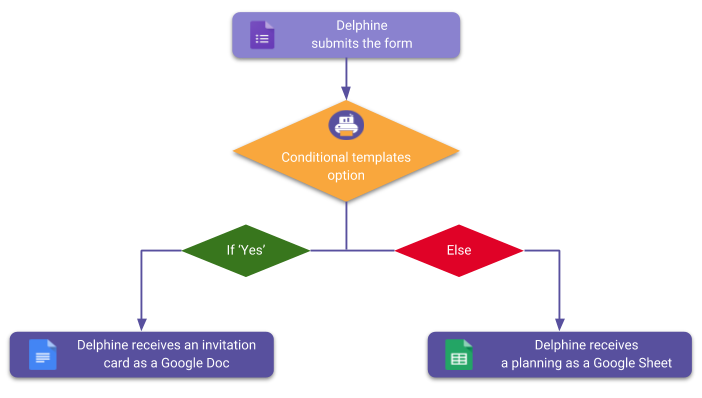 info If you selected ‘Only forward if’, that would mean: ONLY FORWARD the connected form to delphine.leroy@revevol.eu IF she chooses ‘Yes’. Form Publisher would then generate the template linked to the connected form (the planning), but it wouldn’t make sense in our example. We want to generate the invitation card based on the answer of the multiple choice question 'Do you want to join us?'. To know if you are on your current form or on your connected form, read your form title at the top left corner of your form: It is either written 'Event' or 'Connected to Event'. warning Once you connected your form, if you want to add questions on any of the two forms, you will have to add it manually on the other one. In 'Sharing Options & Notifications', we want the form respondent to receive the planning file of future events each time he answers ‘No’ or ‘Maybe’ to the question ‘Do you want to join us?’. Once you are done with all the configuration, open your original form ('Event' file in our example).